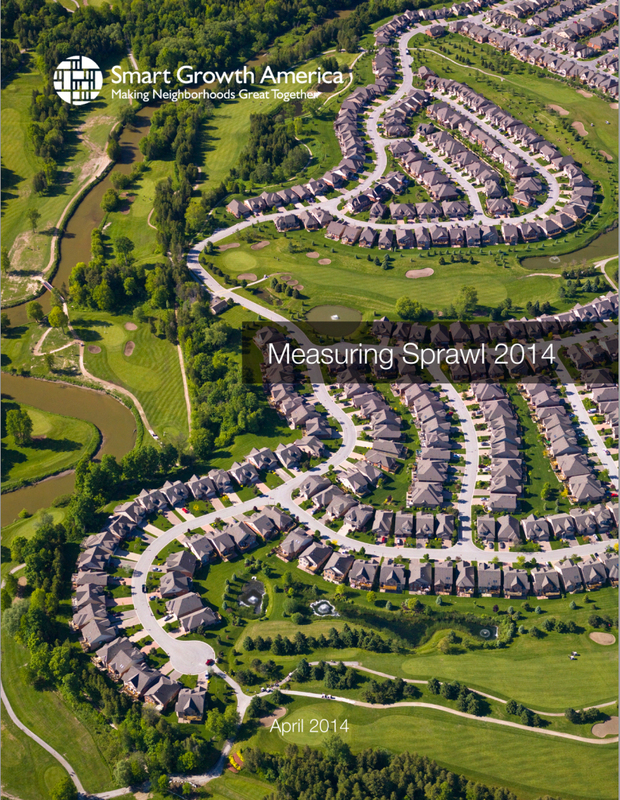 Smart Growth America recently released a report entitled Measuring Sprawl 2014. Measuring Sprawl 2014 considered four factors in its evaluation of development and sprawl: density, land use mix, street connectivity and activity centering. The report evaluated every major metro area in the country, and each was given an overall Sprawl Index score. Much of the report (and its appendix) is comprised of charts (scores and rankings of metropolitan areas and counties), and includes a number of “examples of cities in metro areas that performed well on each of the four index factors, as well as the local public policies that contributed to their success.” While the charts and examples are interesting, the remaining text is a relatively quick read that is very worthwhile. Among other things, the reports addresses “What sprawl means for everyday life.” The short answer is that areas with less sprawl do better across a number of key quality of life factors. Download the report for details. Below is the text of the executive summary, and both the short introduction and conclusion. Some places in the United States are sprawling out and some places are building in compact, connected ways. The difference between these two strategies affects the lives of millions of Americans. In 2002, Smart Growth America released Measuring Sprawl and Its Impact, a landmark study that has been widely used by researchers to examine the costs and benefits of sprawling development. In peer-reviewed research, sprawl has been linked to physical inactivity, obesity, traffic fatalities, poor air quality, residential energy use, emergency response times, teenage driving, lack of social capital and private-vehicle commute distances and times. Measuring Sprawl 2014 updates that research and analyzes development patterns in 221 metropolitan areas and 994 counties in the United States as of 2010, looking to see which communities are more compact and connected and which are more sprawling. Researchers used four primary factors—residential and employment density; neighborhood mix of homes, jobs and services; strength of activity centers and downtowns; and accessibility of the street network—to evaluate development in these areas and assign a Sprawl Index score to each. This report includes a list of the most compact and most sprawling metro areas in the country. This report also examines how Sprawl Index scores relate to life in that community. The researchers found that several quality of life factors improve as index scores rise. Individuals in compact, connected metro areas have greater economic mobility. Individuals in these areas spend less on the combined cost of housing and transportation, and have greater options for the type of transportation to take. In addition, individuals in compact, connected metro areas tend to live longer, safer, healthier lives than their peers in metro areas with sprawl. Obesity is less prevalent in compact counties, and fatal car crashes are less common. Finally, this report includes specific examples of how communities are building to be more connected and walkable, and how policymakers at all levels of government can support their efforts. As regions grow and develop, residents and their elected leaders have many decisions to make. What kind of street network should they build, and how extensive should it be? Should neighborhoods have a mix of homes, shops and offices, or should different types of buildings be kept separate? Will people be able to walk, ride a bicycle or take public transportation through the community, or will driving be the only realistic way for people to get around? Everyone experiences the outcomes associated with these development decisions. How much families pay for housing and transportation, how long workers spend commuting home, the economic opportunities in communities and even personal health are all connected to how neighborhoods and surrounding areas are built. Measuring Sprawl 2014 analyzes development in 221 metropolitan areas across the United States, as well as the relationship between development and quality of life indicators in those areas. This report includes a list of the most compact and most sprawling metro areas in the country. How we choose to build and develop affects everyone’s day-to-day lives. How much we pay for housing and transportation, how long we spend commuting to and from work, economic opportunities in our communities and even personal health are all connected to how our neighborhoods and surrounding areas are built. This study shows that life expectancy, economic mobility, transportation choices and personal health and safety all improve in less sprawling areas. As individuals and their elected leaders recognize these benefits, many decisionmakers choose to encourage this type of growth through changes to public regulations and incentives. This report represents a rigorous statistical analysis of how communities have developed in the United States. It is not, however, a complete picture of every community across the country. The analysis included in this research is an important part of understanding how communities have developed in the United States. We recognize that qualitative information—such as the design of the streets and buildings, the quality of park space and the types of businesses nearby, among many other factors—also has a significant impact on the quality of life within a neighborhood and a region. Local elected officials, state leaders and federal lawmakers can all help communities as they seek to grow in ways that support these improved outcomes. Smart Growth America helps communities understand the long-term impact of their development decisions. We work with public and private sectors so local communities can achieve multiple outcomes such as increased economic mobility and improved personal health. By providing this type of research, alongside best practices used in many of these communities, we hope more places will closely consider development decisions as a key to long-term success. Washington, DC—People in compact, connected metropolitan regions are more likely to move up the economic ladder, have lower household costs, enjoy more transportation choices and lead longer, safer, healthier lives according to a new report out today by Smart Growth America. Measuring Sprawl 2014 evaluates development in 221 major metropolitan areas in the United States, and ranks these areas based on how sprawling or compact they are. The report also examines how sprawl relates to life in those communities, based on factors like economic mobility, the cost of housing and transportation, life expectancy, obesity, chronic disease and safety. See the rankings and download the full report here. Smart Growth America is the only national organization dedicated to researching, advocating for and leading coalitions to bring better development to more communities nationwide. From providing more sidewalks to ensuring more homes are built near public transportation or that productive farms remain a part of our communities, smart growth helps make sure people across the nation can live in great neighborhoods. For additional information click here.